This team came so close to reaching the all-hallowed (at least in Pittsburgh) .500 mark (33-34 going into Baltimore) but have begun their usual downward slide. The team currently sits at 34-38 and things don’t look to change any time soon. 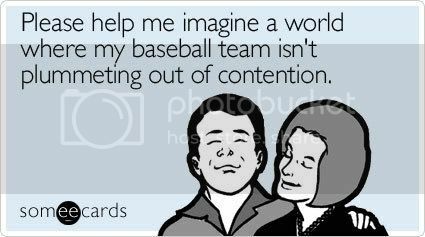 I found this picture on TheBurghBlog that pretty much sums up my feelings about the Buccos. It’s amazing how far this team has fallen since the early 90’s when they contended for the NLCS, back when Barry Bonds had a normal-sized melon and Andy Van Slyke roamed center field. It’s funny, I’ve been called a “fair-weather fan” because I badmouth the Buccos. I retort by saying, “If you support losing, then you are a loser yourself.” Give me a team that at least looks like they are trying to win games and I’ll follow them to the ends of the Earth. Show me a team that is making the right moves to become competitive and I’ll support the team by going to games and applaud their effort even if that effort doesn’t being victories. However, this Pirates team, over the past 16 years, has shown me no such thing. They are the third most profitable team in baseball and make money before the first person walks through the turnstiles, but they don’t put any of that money back into the team. Year after year, poor draft after poor free agent signing has left this team (a team tied for 6th with the Reds and Giants for most World Series victories – 5) bereft of hope and lingering just above being a very good minor league team. Until ownership changes or MLB decides to institute a salary cap (it’s don’t wonders for the NFL and NHL) this team will never be anything more than a doormat. Four years ago, I overheard a regular at the bar I frequent make a bold prediction: “I bet ya the Pirates make it to the World Series this year.” Hearing that, I immediately tuned to him and opened my wallet. He wouldn’t take a bet for money (probably realizing the folly of his suggestion), rather suggesting a “gentleman’s bet” where the loser buys a drink for the winner. Of course, I accepted and won my free drink later that year (Captain and Coke). The next year, he challenged me again, only this time he said the Pirates would make the playoffs. I again said they wouldn’t make .500 at the end of the season. Again, I won (Yuengling Lager draft). The next season, the bet changed once again, with him saying the Pirates would finish .500 or better. Again, knowing my Buccos, I took the bet and won myself another drink (I.C. Light draft). Of course, reinstated the bet once again this year. So – this is directed to Ray – I’m going to want an I.C. Light so I can toast our Buccos who are just so damn predictable. Next An Adventurer Is You!